The storm was rolling in fast. The wind had been out of the east ahead of it for 6 hours without a break, and growing stronger and stronger. The odd bit was that the storm had moved out to sea the day before and had turned around suddenly in the morning. It had lightninged itself out on the first pass, and they’d had a piece of work putting the fires out. Now it was coming back, the adventurers knew something was afoot. They jumped aboard their flying ship and went out to meet the storm. They hoped this would be a problem more profitable and to their skills than putting out fires. Mind Weave Dragons are greedy and weak-willed. They are however very powerful, growing only mightier with age until they plateau at around 20,000 years old and between 1,600 and 2,000 feet long. Colored dragons are aggressive with lots of offensive power. Metallic dragons are passive and with defensive abilities. The general dragon post describes Mind Weave dragons in general, including how to interpret dragon characteristics defined below. Spell Points: 4 SP per foot, recovery 8+0.5 per foot SP per hour. Tail: ½ of Length, 1d4+1d4 per 20 feet, ½ speed. 1d4 lightning damage per 30 feet of lightning damage. Breath Weapon: Lightning Stream, 5 degrees to 15 degrees with 1d4 degree error, 2d6 per 10 feet lightning damage. Attract Storm: The dragon can draw the nearest large storm toward him with a wind out of its direction. The speed of this wind is halved for each mile away from the dragon in the direction of the storm. The speed at the dragon’s position is 10 mph per spell point spent doing it per 2 seconds. (The size of the storm is determined by rainfall mainly, but also cloud cover.) Can spend up to the square root of its length divided by 2 SP per turn. Description: Yellow dragons are extremely restless, especially at a young age, but they are not foolish. As hatchlings, they fly from the nest in search of a good lair. Of all dragons, they are the most particular about finding one that cannot be easy discovered. This is in large part because they spend almost no time there, even when fully grown. They much prefer to wander with the storms, attacking as their whim dictates and then vanishing with the better treasures back to their horde. Yellow dragons tend to live to be very old and large, more often that other dragons, because while they have no qualms about bringing furious thunder storms down on towns and cities, they do not stay long, and they are too smart to strike near their lair. It is said that lightning never strikes in the same place twice, and this is at least true of the lightning dragon. It is a piece of luck for forces capable of defeating the dragon to be present without the dragon noticing and avoiding the encounter. It is a major achievement of any dragon slayer to bring one down. Lightning dragons may work together if they meet each other in the sky, but they are far more likely to work with drakes like the Jealkia who swarm and follow them for the joy of their lightning storms. Lightning dragons are known to often speak drakish languages in order to speak with these, their loyal friends. As a Game Master, when and how would you have a Yellow Dragon strike? Could you shape a whole campaign around chasing one? What role would it play in your game? Let us know in the comments below. 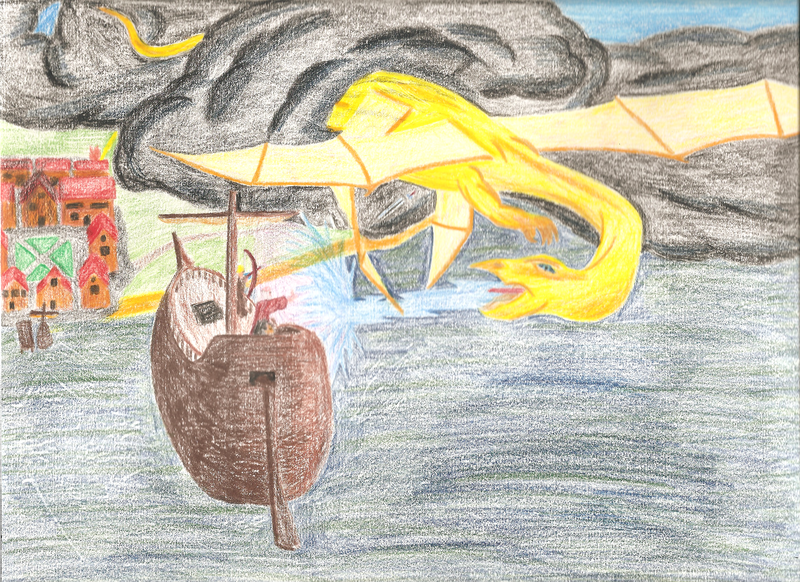 This entry was posted in Dragons, Monsters and tagged dragon, lightning, storm, thunder, wanderlust, yellow, yellow dragon. Bookmark the permalink.